The regions top Late Model drivers gathered at Oakshade Raceway for the American Late Model Series (ALMS) event on Saturday night. 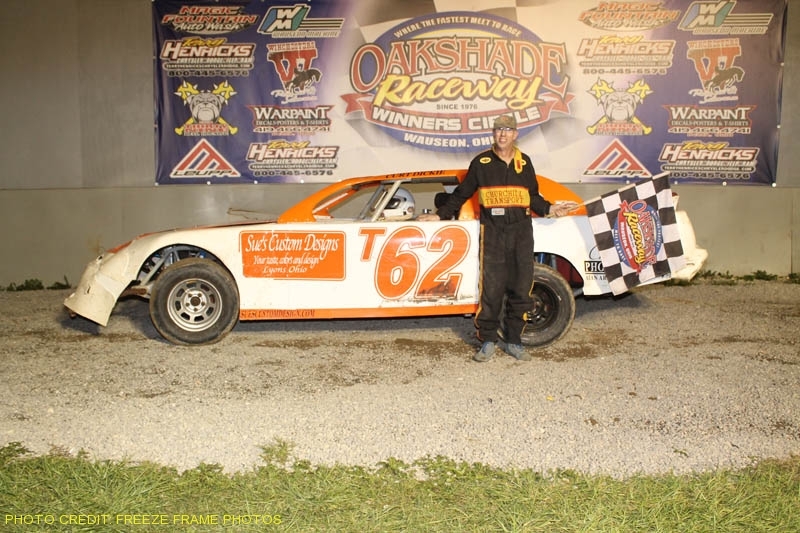 The UMP national point leader and Oakshade Raceway point leader, Rusty Schlenk, added to his point leads with his second Oakshade feature win of the year. Last weeks feature winner, Jon Henry, started on the pole and held the early lead while Rusty Schlenk and Matt Miller battled for second. Miller eventully got the position and then worked the outside around Henry for the lead on lap eight. A few laps later, Schlenk disposed of Henry for second. Schlenk closed in on Miller for the race lead and on lap 20, the two drivers were racing side by side and came up on Kevin Reeve who was at the tail end of the lead lap. The leaders split to the inside and outside of Reeve. There was a little contact and Reeve spun around to bring out the first yellow flag of the race. A couple laps later, Schlenk finally worked his way around Miller to take over the lead for good. Schlenk was presented with the $2,000 ALMS check for the victory. The 1991 Late Model track champion, Matt Miller, settled for a second place finish with Jon Henry ending up third. ALMS point leader Jeep Van Wormer finished fourth with Brian Ruhlman rounding out the top five. The 2008 Oakshade Raceway UMP Sportsman champion was back in championship form in the UMP Sportsman feature. Mike Jessen took the lead from Brice Luttrell on lap four and didn’t look back. If he did, he would have seen the 71 of Rusty Smith trying to close in. A caution on lap 14 set up a double-file restart in which Smith tried to cut down to the inside and got hooked together with Brett Miller. The two drivers then spun in turn two, giving up the second and third positions and bringing out the yellow flag again. Jessen went on to pick up his first feature win of the year and put himself just one point behind Tim Line for the Sportsman point lead. Brian Fisher got by Brice Luttrell to finish second with Luttrell crossing the finish line third. Scot Mills and Joe Smith finished fourth and fifth respectively. The UMP Bomber A Main produced some of the most exciting racing of the night with multiple lead changes. Jeff Foks led the first lap while battling three-wide for the lead. By lap two, Terry Rushlow took command. Shortly after that, Foks spun and collected last week’s feature winner Danny Hogrefe. Curt Lancaster then showed his hand and pressured Rushlow for the lead. After a couple more cautions, Jeff Geis finally took over the lead on lap six. One lap later, Lancaster took his turn in the lead for a single lap. Rushlow battled back to the lead on lap eight. Geis challenged Rushlow for the top spot and eventually took over the lead. Rushlow came back to pressure for the lead again late in the race, but Geis held on to win his first Bomber A Main. Terry Rushlow wound up second and Jim Scout worked his way to a third place finish after starting 19th. Billy Brown was fourth and Danny Hogrefe recovered to finish fifth and maintains his Bomber point lead. Derek Morris led from flag to flag in a caution-free Hornet feature event fending off the challenge from Drew Smith to pick up his second feature win of the year. William Cundick finished third behind Smith with Cody Stetten and Josh Froelich rounding out the rest of the top five finishers. Todd Silvey won the Bomber C Main last week. This week he led the entire distance of the Bomber B Main to pick up another feature win. Kevin Cole had a top five run going, but spun on lap five, putting a damper on his strong run. In the end, Tony Tolles wound up second behind Silvey after starting way back in 17th. Joe Cordes was third followed by Josh Montague and Jim Remley. The final event of the night, the Bomber C Main, started off with a wreck in turn one with Terry Rump, Skyler Plotts, Joe Foks and Jamie Faller in the pile up. Chris Tressler led the first lap once racing resumed and Adam Noonan took over the lead on lap two. Noonan held on to the lead all the way to the finish to earn his first UMP Bomber win after moving up to Bombers from the Hornet division this year. Chane Stuckey moved up to finish second with Ron Todd taking third. Chris Tressler slipped back to finish fourth with Jesse Burgett finishing fifth. On Saturday, June 5, race fans will be treated to two full Late Model features for the price of one. It is the UMP Late Model Push Truck Dual Features along with action from the UMP Sportsman, UMP Bomber and Hornet divisions. Gate open at 4pm with racing at 7pm. A huge crowd packed the stands on L&M Enterprise Concrete and Leo’s Metal and Wood Night at Oakshade Raceway to see how Nascar driver Kenny Schrader would fair against the fastest area UMP Late Model drivers. Schrader started off strong with an impressive heat race win and looked to be one of the cars to beat going in to the feature event with a row two starting postion. Jon Henry from Ada, Ohio started on the pole and grabbed the early lead of the UMP Late Model feature. Rusty Schlenk and Kevin Reeve had a heated battle going for second until a caution for an incident involving Dan Wallace and Mike Bores on lap three. Schrader was running fifth before the caution and spun in the middle of traffic entering turn two on the restart. At least seven other cars were collected in the pile up including Tim Sabo, Mike Bores, Tom Ordway, Mike Miller, Rob Anderzack, Steve Kester and Chris Keller. Parts fell off Schrader’s torn up race car as he limped back to the pits. Once the track was clear, Kevin Reeve took advantage of the double-file restart and battled side by side with Henry for the lead. At lap five, Reeve had the advantage for the race lead. Henry fought back and reassumed the lead on lap ten as Reeve began to slip back. A late caution flag flew on lap 21 after Dusty Moore spun while battling with Brad Eitniear and Ryan Missler for fifth. That incident allowed national UMP Late Model point leader Rusty Schlenk to restart alongside Henry with only four laps remaining, but Henry was too strong and held on to pick up his first Oakshade feature win of the year. Schlenk finished second followed by Brian Ruhlman in third. Reeve slipped back to finish fourth with Brad Eitniear moving up to finish fifth after starting 16th. Defending Oakshade Raceway UMP Sportsman Champion Brett Miller started on the pole of the UMP Sportsman feature and went on to win his first of the year. Brice Luttrell held the lead for about five laps after getting by Miller on a restart. Miller regained the lead on another restart and never looked back. Brice Luttrell finished second followed by Tim Line, Rusty Smith and Brian Fisher. Matt Lane had a strong run early in the UMP Bomber A Main, leading the first five laps. Danny Hogrefe took command after that and led the remaining distance to win his first A Main of the year which also put him in the Oakshade Bomber point lead. Dan Shaffer and Craig Dippman pressured Hogrefe near the end of the race, but ended up finishing second and third respectively. Jim Scout was fourth and Matt Lane held on to a top five finish. Dylan Herman made it two feature wins in a row after winning the Hornet feature event for the second consecutive week. Drew Smith pressured early for the lead, but then faded back. Derek Morris took over second and then took advantage of slower lapped traffic to close in on Herman, but Herman held on for the victory. Morris finished second followed by Drew Smith, Josh Froelich and Curtis Spurgeon. A big crash slowed the action on lap five of the UMP Bomber B Main. With Jeff Geis leading, Donovan Paskin and Gregg Detray were battling for position and got together on the front stretch. The cars scraped along the wall and then came down off the wall right in front of Rich Noonan. Noonan slammed hard into the driver side of Paskin ending both drivers’ nights. Curt Lancaster got by Geis for the lead on lap eight. Geis and Dave “Gumby” Golembiewski had a good battle going for second as Lancaster took the checkered flag. Geis held off Golembiewski for second. Josh Montague finished fourth with Ron Bloomfield fifth. Todd Silvey took the lead from Chris Tressler on lap two in the UMP Bomber C Main on his way to an easy victory. Tressler held on to finish second followed by Rex Strow, Jake Reckner and Tony Sylvestri. The American Late Model Series returns to Oakshade Raceway this Memorial Day weekend paying $2000 to win. UMP Sportsman, UMP Bombers and Hornets will be in action as welll with gates opening at 4pm and racing at 7pm. Rusty Schlenk, the “Jackson Assassin,” made his way back to victory lane for the first time this season at Oakshade Raceway in a close UMP Late Model feature over Casey Noonan while Jim Scout dominated the first ever Spring Bomber Clash sponsored by Extreme Chassis. Schlenk started on the outside of the of the front row and darted out to the lead at the drop of the green flag. Casey Noonan got the jump on Schlenk on a double-file restart after a lap three debris caution. Noonan held the lead for a few laps until Schlenk made it by on lap six. The two drivers continued their heated battle for the lead racing side by side lap after lap and swapping the lead back and forth. Schlenk eventually got control and began to pull away in the closing laps on his way to the feature win which put him in the early season point lead. The defending track champion, Casey Noonan finished second followed by Jeff Babcock, Devin Shiels and Kevin Reeve who started deep in the field. Tim Fisher led the first seven laps of the UMP Sportsman feature while Brice Luttrell and Mike Jessen worked their way toward the front. Luttrell moved into second on lap six and got by Fisher for the lead on lap eight. Jessen followed Luttrell past Fisher for second. Jessen then began to pressure Luttrell for the top spot, but Luttrell held him off to earn his first UMP Sportsman feature win at Oakshade Raceway. Last week’s feature winner, Tim Line, finished third behind Mike Jessen. George Lindsey was fourth and Tim Fisher slipped back to end up fifth. Jim Scout wasted no time in taking command of the Spring Bomber Clash UMP Bomber A Main feature event after starting on the outside of the front row. Scout started to open up a large lead on the rest of the field until a caution on lap seven slowed things down and allowed Danny Hogrefe to start alongside Scout in the double-file restart. Using a borrowed motor, Scout once again pulled away and was the class of the field. Scout’s first feature win of the year earned him $500 courtesy of Extreme Chassis. Hogrefe gave it everything he had and ended up second with Billy Brown working through heavy traffic to finish third. Dan Shaffer finished fourth with Jeff Foks ending up fifth. The Oakshade Hornet feature was dominated by Dylan Herman who got a good run at the start to the inside of Derek Morris. Herman led every lap of the event while Derek Morris and Drew Smith had a good battle going for second with Morris coming out on top of that battle behind Herman. Josh Froelich came home fourth while Katie Frederick posted a fifth place finish. Kevin Cole and Tim McNicol battled for the early lead in the UMP Bomber B Main, but Terry Rushlow, who started elevnth, took the lead on lap two. Rushlow went on to an easy victory over Kevin Cole. Third place went to Jeff Geis after starting 16th. Marty Bloomer was fourth while Joe Smith gained the most positions to finish fifth after starting 22nd. An early three-wide battle for the lead in the UMP Bomber C Main was nullified when the caution flag flew for an incident involving Craig Strow and Rick Foreman after Dean Taylor and Joe Cordes split Jake Reckner while battling for the lead. Reckner couldn’t take advantage of the break to maintain the lead as Taylor took over on lap three. Cordes ended up second while Joe Overmyer finished third after starting deep in the field. Reckner slipped back to fourth and Gabe Mueller finished fifth after also starting deep in the field. Nascar superstar Kenny Schrader will be joining the competition among the UMP Late Models at Oakshade Raceway this Saturday, May 22 sponsored by Leo’s Metal and Wood and L&M Enterprise Concrete. UMP Sportsmen, UMP Bombers and Hornets will also be in action with the gates opening at 4pm and racing at 7pm.